Views from my kitchen window: IS THIS SIBERIA? The above view is a very rare one indeed! Why do I say this? Well, you can expect to see it only about once in every four years. Several rare events have to coincide to result in this outcome. 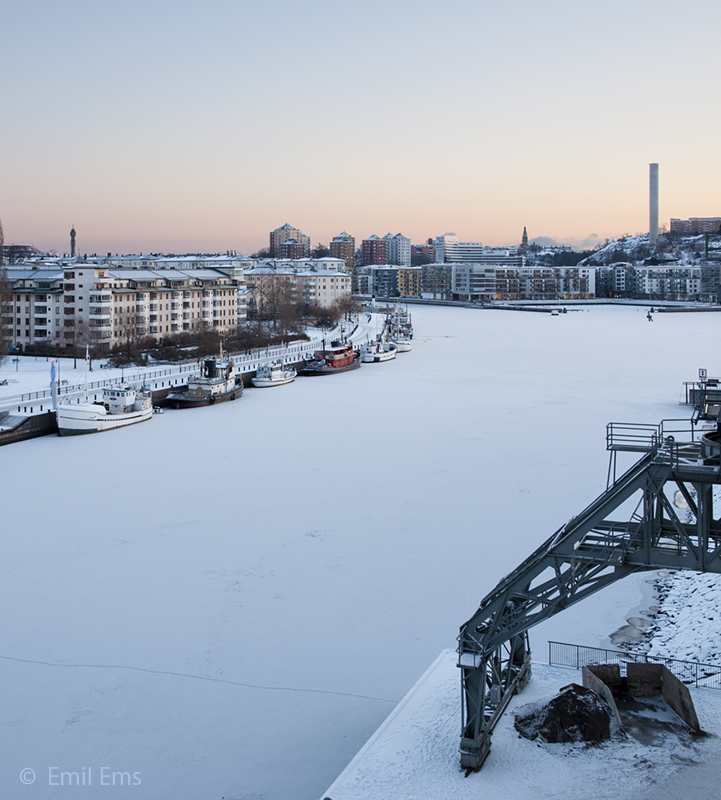 First, temperature the day before should not be much lower than 0° C, to prevent partial freezing over of Hammarby Canal. Second, there must be a sudden and large drop in temperature after midnight (after the last boat has passed the canal). Third, this drop of temperature has to be accompanied by a slight snowfall. Third, the snowfall must stop before dawn. And, fourth, I must have the good luck of looking out of my kitchen window just slightly before 7 am this time of the year, when dawn is already in motion, and before any ship has passed or crossed the canal. Last week was a heavy one for me. On Monday, I had a jaw operation, which is preventing me from eating solid food until the stitches are taken out (will be tomorrow). As a result, I am living at the moment with a diet of cottage cheese, soup and yoghurt. This has a surprising effect on my contours, since I have lost more than 5 kilos in weight already. But it also somehow dampens vitality, with the body attempting to heal the wounds and coping with being sustained only by fluids at the same time. On top of that, I also caught the flu. This actually dampened my longing for fast food, but compounded the loss of vigour and caused my sleep to be troubled, short and interrupted. So it happened that I was driven out of bed already a bit after 6 am on Sunday last. A pity, since it was still dark and I had to turn on all the lights in the apartment to enliven spirit. But, gradually, as I was preparing breakfast [making coffee and opening a can of cottage cheese ;–)], dark changed to dawn and I started to glimpse a first rosy shimmer above Hammarby Sound. My kitchen table is located smack opposite, so I could watch it through the window without having to put my nose out into the cold. And what a view it was! Silence supreme was reigning over Hammarby Sjöstad, not a sound, not even with a window slightly ajar. The lake surface looked like a newly painted hospital floor, white and even and, above it all, the perfect trimming of a rosy dusk. Alas, serenity did not last. As I was surpling my Nespresso, and the hour advancing versus sevenish, suddenly, the first ferry started up on the Southern Island and started its traverse towards our side of the Sound. This was no silent process, I can tell you! The vessel had to labour hard to get going! And the sound, the sound! Like a giant cracking giant hazlenuts! On and on the boat laboured, first forward a meter or two, then backward again to push off and get going again. Eventually, after 15 minutes hard work it reached the opposite berth, a traverse that usually takes only about four minutes. This Sunday was special for yet another reason. 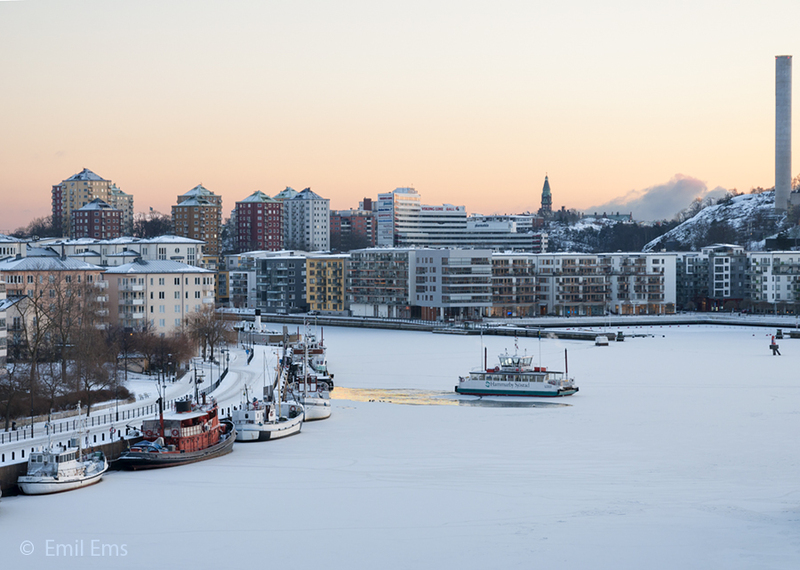 The sun kept shining until early afternoon, a rare sight indeed in Stockholm winter time. Under a blue sky, and as the day progressed, large ship after large ship passed Hammarby Kanal in their voyage from the Baltic to Lake Mälar or vice versa, breaking up the ice and providing me with yet another view, this time smack below my balcony, and far more common than the view shown in the head picture. 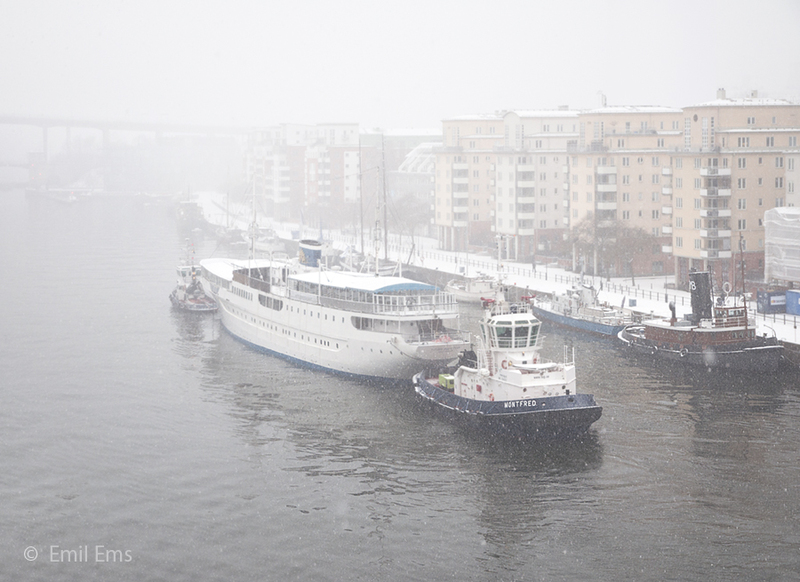 4 pm, large boats having broken the ice during the day. How does Siberia come into the story, you may well ask. Very simple, our part of the world is at present subject to strong North Eastern currents, stemming from a high pressure zone hovering around Northern Siberia. They cause exceptionally cold air to stream over the still warm waters of the Baltic Sea, sucking up moisture as they go and unloading it in the form of very cold snow on us poor Stockholmers. Ever since last Sunday, each morning is greeting me with the picture you can see below. Getting to my usual breakfast haunt, for a cup of coffee and a newspaper, means bulking up, wading through decimeter high snow drifts (plowing on my street is starting first later in the day) and being blasted by a storm of sharp icycles. How will this all end, I ask you! Will climate change bring consolation? I fear not! Whilst the continent down South will getting warmer, the Gulf Stream, a giant pumping action from the Gulf of Mexico to the Arctic, and warming Scandinavia (not to forget Iceland and Greenland), will surely start to subside, changing our climate up here to become more like that of Alaska (Stockholm is at the same latitude as Kodiak after all!). So I fear that we have to see this Siberian interlude as a first sign of things to come. God help us! Every morning the same; blizzard after blizzard! What a marvelous tour. I know this image so well from your past posts. It's like finding an old friend, but this time all dressed up in stunning gorgeous new clothes. the 4 pm photo is gourgeous! Lese immer wieder sehr gerne von dir!!! Vielen Dank für diese schönen Impressionen – wirklich erstaunlich, dass du noch gerade den Moment erwischt hast, wo das Eis das sich gebildet hatte noch nicht „unterbrochen“ wurde. Mein zweitliebstes Foto ist dann das von 4pm – wo sich wunderschöne Eis-Stückchen-Formen gebildet haben – fast wie ein Gemälde!!! Fantastisch diese Schönheit der Natur, und dann noch alles direkt vor deinem Küchenfenster!!! Ganz herzliche Grüße aus Gran Canaria! Brrrrr... We are freezing our tucheses off down here, too, Emil. Even had a dusting of snow/sleet. There was still snow in the shadows in Sacramento yesterday! Love the Kanal photos. PS Hard to imagine you wolfing down Big Macs. Perhaps you mean to say "solid food"? YOu are second friend who is doing a liquid regime. I must try it as I would give a lot to shed 5 kilos so fast! Stay warm and tread carefully. I am pleased that you like my blog. Your praise, as that of all the others, keeps me going in this winter freeze. And thanks a lot for the correction. In Swedish, liquid food is called ”fast föda" and the adjective “fast” just sneaked into my English. But this is corrected now, thanks to you! Grandiose Bilder, wie immer, aber nicht so grandiose Neuigkeiten! Ich hoffe es geht Dir wieder besser. Solche Operationen im Mund sind besonders unangenehm – außerdem bist Du schon schlank genug!! Hier ist es auch ziemlich kalt, aber vermutlich bei weitem nicht so schlimm, wie bei Euch. Auch hier haben wir klirrende Kälte von minus 25 Grad in Zeltweg, dem kältesten Ort in Österreich, und die kältesten Temperaturen seit 30 Jahren, auf den Bergen sogar minus 30. Dafür sind ein paar seltene Schneeammern aus dem hohen Norden bei uns, und wir haben viel Freude mit den nicht scheuen und sehr kooperativen Vöglein. Die posieren für jedes Photoshooting und werden dafür mir Körnern belohnt. Hoffe Du bist wohlauf und warm. Hallo Emil, danke für die beeindruckenden, schönen Bilder vom Hammarby Canal, ein einzigartiges Schauspiel ist hier dem Winter in Stockholm gelungen! Hoffentlich geht´s dir schon besser! It's very beautiful, but it seems really, really cold! I'm spoiled living in the Northern California where the temperature, even in the midst of the coldest month, won't drop below 40F. The picture of cracked ice looked like wings of black and white butterflies. Thank you for sharing your experience. Marvelous photos and thoughtful, thought-provoking writing. Hoping that you've healed from the jaw operation and the flu! Great photos. And the first one is extra special, and even better together with the explanation of when the event you witnessed occurs. Looking at it from Southern California, where a cold snap has brought temperatures down to 63F (but nights can even go down to mid 40'sF!) and it actually rained yesterday, the third rainy day since I arrived here in early November, Stockholm seems really cold. But Ireland is also seriously cold. You expect rain, sun, more rain, more sun, crazy winds, but sub-zero is pretty rare. Keeping an eye on my Irish, Co. Louth, abode, the impending arrival of what they call the 'Beast from the East' has just been classed as a 'code red' event and businesses (even IKEA), schools etc. are closed. 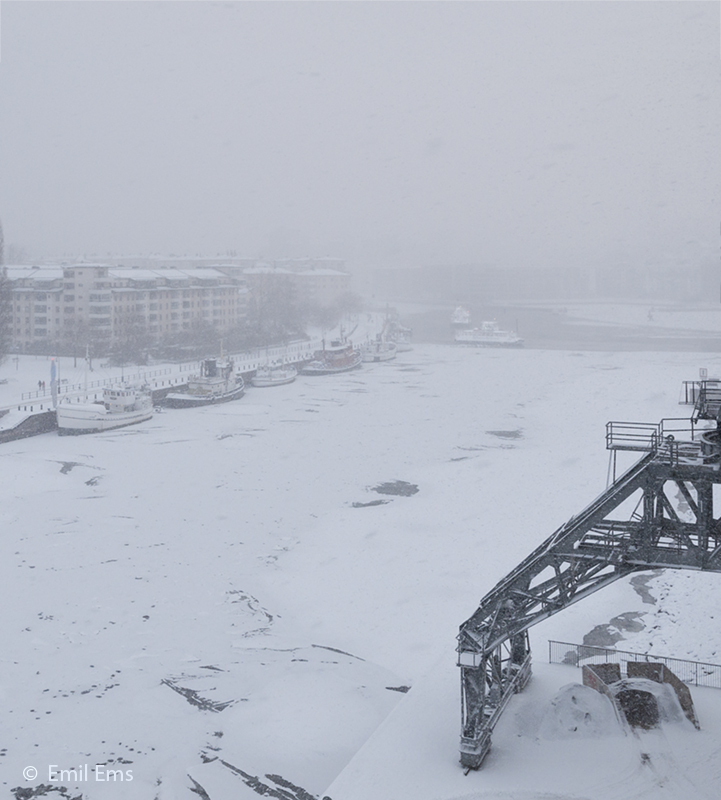 The temperature in the local town is -3C (probably warm in your terms) but blizzards are expected in the next 24 hours. Thankfully I can look at the temperature recorded in the house there and can switch on the heating for periods of time. So I am keeping it above 6C, since do not want to return to a burst something. These two scenarios illustrate the importance of what you were doing in DG Environment on pricing environmental impacts, before I poached you back to deal with money issues. I believe that the planet is warming (and I doubt if most scientists would disagree), but some would instance warming and cooling episodes in the past. Yes we had an ice age and probably warm ages in which we now live. But for me the present issue is more accurately reflected in extreme weather events and the impact of man in these. I know little about extreme events in the US or the sort of US which is less than the US (Puerto Rico - which I actually visited many years ago), so I pass on that. But a recorded hurricane in Ireland several months ago (I do not recall another such event ever), sub zero temperatures in areas close to the sea (that does not normally happen, at least there) and many storms and trees down in Ireland I experienced when there seem slightly relevant. Southern California, in my humble opinion, could eventually revert to being a desert - Patrice has replaced all the garden plants with native ones and cactii and succulents from further south, but water even for them will eventually dry up here and it will look like Mexico from the plane. Fly over the border and look at what the landscape would look like if the Colorado river (which I seem to remember has nothing left to deliver to the sea or Mexico) and the Northern Californian canals did not supply the water to the south. And the house in Ireland which is surrounded on 3 sides by the Irish Sea and temperatures don't normally go minus (Centigrade) is changing and will eventually become an icepack, although the sea will probably swamp it before then. Maybe I am being too pessimistic but I cannot see any other long-term outcome. I am sorry for the next generation who will have to undo the stuff we have allowed - in Ireland cattle are not too environmentally friendly, but like coal mines in the US, they are 'politically friendly'. On a more personal basis, I Hope your surgery eventually lets you eat comfortably and, more importantly, enjoy your food. I hope that you are recovering now. If it is that cold you might want to consider getting your news online rather than venturing out. We loved your pictures, particularly the "painted" ice and the broken up frozen ice formed by a giant cracking up giant hazelnuts. We wish you well and the planet as well. Du hast da schon einen tollen Hochsitz! Hej Emil och tack för de vackra bilderna! Även här i Saint-Raphaël har det snöat. 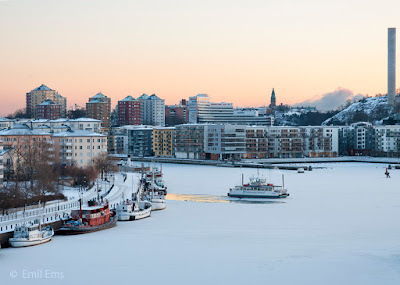 Inte som i Stockholm, men ändå. Det är fem år sedan sist. Global warming is projected to have an effect on the weather, including temperatures. However, the effect is likely not going to be straightforward when it comes to temperature in the Northern hemisphere. "The IPCC believe it is very likely that the Gulf Stream will slow down during the 21st Century but very unlikely it will undergo a ‘large abrupt transition’. The average reduction predicted by the various models used is 25%. This slowing will have a cooling effect but the temperature will still increase in the region overall." Wow! I must have hit a nerve with this humble blog. So many comments, much more than on any a post received in latter years. I am truly grateful to all you commenters, for taking the effort to respond to my simple musings. The more so since I have not heard from some of you for some time and am pleased to meet you here again! 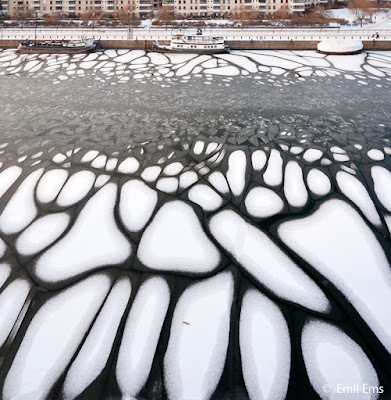 I was thrilled to see that one picture on the post, the one with the ice breaking up, has tickled your fancy especially, leading to interpretations as various as: “Like a painting”; “Like the wings of black and white butterflies”; “Like formed by a giant cracking up giant hazelnuts”; “Looking like big feet”. This corroborates my belief that pictures often work through affecting the subconscious! I was also thrilled to receive news about weather conditions from both sides of the Atlantic, which confirm that they are far from ordinary this winter. Again, kind greetings and thanks to you all, for this great interaction between blogger and commenters.